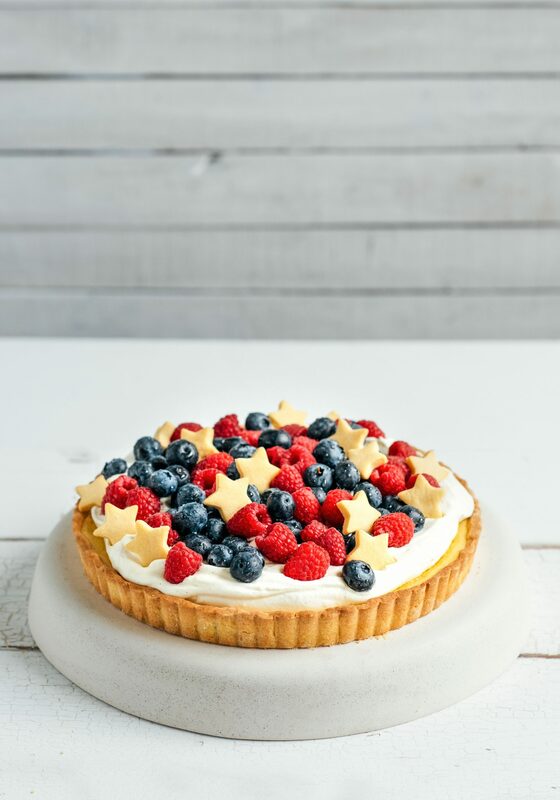 Well hello there, bet you didn’t expect to hear from me again so quickly – but as you can see I have been working on this gorgeous Christmas tart recipe for my friends at Mainland, and had a chance to shoot it this week, so ta dah! 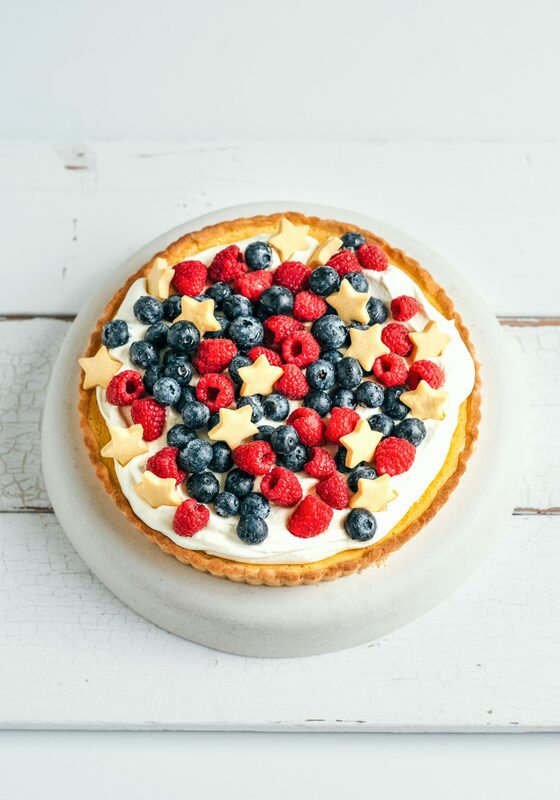 I call it a Christmas tart but obviously it is a summer tart that would suit any festive occasion, with a buttery shortcrust base it is loaded with a lush white chocolate and vanilla filling then topped with pillowy vanilla cream and finally a mixture of sweet berries and shortbread stars. I briefly considered dusting it with icing sugar, which would definitely be an option if you fancy. 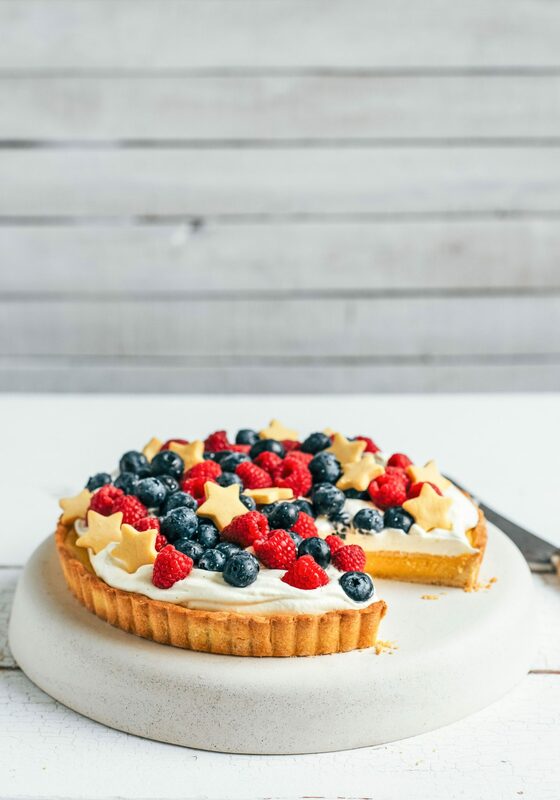 As you undoubtedly know I love a good tart – sweet or savoury, hot or cold, they provide such a bloody perfect make-ahead solution to so many entertaining scenarios. The key (and for so many people the scary bit) is the pastry. But seriously, it couldn’t be easier – the trick is to use good quality ingredients (like Mainland butter!) and follow the recipe, then you can’t go wrong. From a technical perspective, I use two main ways to prepare pastry, either pâte briseé or pâte sablée. The first is the method people tend to be familiar with using cold chopped butter, and the second, and the one I use most often is with softened butter, which I find easier to work with (and the method used in today’s recipe). Traditionally unsalted butter is used in sweet baking so as not to detract from the filling flavour, but salted can be an option when using fillings such as caramel, dark chocolate or peanuts. And by crikey, given it has only been a few days what else is news!? Well I will soon be another year older (but can’t complain hey, the alternative is less than optimal), and next weekend I will be heading away for a mini break to Martinborough with two of my favourite people in the universe – hurrah! It is my intention to finally get my act together in the wine department and start the very nubby nub of a wine collection – how many bottles do I need for that do you think (see I am talking bottles, not cases…)? I am very untrendy (God is trendy still even a word, makes me think of Kath and Kim) when it comes to wine given that I eschew the cool kids’ sauvignon blanc and pinot noir in favour of just about anything else. My favourite summer tipple (as a pre-dinner wine) is dry riesling, and in the red department I’m a sucker for a blend….Any waaaay enuogh of me – be bold, be brave, make this tart with your own pastry, and let me know how you go!!! You will need a 25cm round tart tin with a removable base for this recipe. Whiz the butter, icing sugar and flour until it forms big clumpy breadcrumbs. Add the cream and pulse again until it starts coming together. Tip onto the bench and squash and pat into a big round fat sausage about 14cm long, wrap in plastic wrap and chill in the fridge for 15 minutes. Remove the pastry from the fridge, sit for 5 minutes, then slice into 1/2 cm thick rounds. Lay out onto the bottom of the tin and squish into place on the base and up the sides of the tin. Chill in the freezer for half an hour while the oven preheats to 180˚C. You will have some pastry left over – this can be rolled out between two sheets of baking paper, then used to cut out shapes for decorating. (These can be cooked separately on a baking paper lined oven tray for 170˚C for 5-8 minutes). Gently prick the base of the pastry with a fork and cut out a circle baking paper, a little larger than the tin. Line the pastry with baking paper and fill with baking beans or rice – it must come at least some way up the sides of the pastry. Cook for 10 minutes, carefully remove the paper and beans/rice and cook a further 8 minutes until lightly golden. While this is cooking put the cream, 3/4 cup of the milk, the caster sugar and scraped vanilla seeds into a pot and heat until simmering. Put the egg and yolks into a big jug and whisk until pale. Whisk the cornflour with the remaining milk and whisk into the eggs. Pour the hot cream mixture into the eggs, whisking constantly, then pour back into the pot and return to a gentle heat. Cook, stirring for 3-4 minutes until thickened slightly. Remove from the heat, add the white chocolate and stir until the chocolate is melted. Once the pastry is ready (baked ‘blind’) remove it from the oven, place it on a baking tray and gently pour in the filling – by my calculations you should be spot on with the amount – you want it to come almost to the top. Reduce the oven temperature to 170˚C then very gently pop the tart back into the oven and cook a further 15 minutes until just set. Once cool, chill in the fridge until half an hour before serving. For the topping beat the cream to soft peaks then add the sour cream, vanilla seeds and icing sugar and beat again until smooth. I wasn’t getting emails either so insubscribed and subscribed again. All good. So sorry about that Phillipa – there has been some weird business with the website, so a few old recipes are being resent as many people didn’t receive them! Same story from me, but I have received the last three emails so I’m super happy again and looking forward to trying this one out for our Boxing Day “Friends Get Together”. The asparagus savoury tarts you posted a few days ago were a winner – thanks. Made this tart today and it’s fabulous! I really love your recipe instructions, they are exactly what you need to do. The sour cream added into the whipped cream topping made for a really billowy creamy delight.